This study examined whether supplementing the diet with a commercial supplement containing zinc magnesium aspartate (ZMA) during training affects zinc and magnesium status, anabolic and catabolic hormone profiles, and/or training adaptations. Forty-two resistance trained males (27 ± 9 yrs; 178 ± 8 cm, 85 ± 15 kg, 18.6 ± 6% body fat) were matched according to fat free mass and randomly assigned to ingest in a double blind manner either a dextrose placebo (P) or ZMA 30–60 minutes prior to going to sleep during 8-weeks of standardized resistance-training. Subjects completed testing sessions at 0, 4, and 8 weeks that included body composition assessment as determined by dual energy X-ray absorptiometry, 1-RM and muscular endurance tests on the bench and leg press, a Wingate anaerobic power test, and blood analysis to assess anabolic/catabolic status as well as markers of health. Data were analyzed using repeated measures ANOVA. Results indicated that ZMA supplementation non-significantly increased serum zinc levels by 11 – 17% (p = 0.12). However, no significant differences were observed between groups in anabolic or catabolic hormone status, body composition, 1-RM bench press and leg press, upper or lower body muscular endurance, or cycling anaerobic capacity. Results indicate that ZMA supplementation during training does not appear to enhance training adaptations in resistance trained populations. Zinc is an essential trace element involved in a range of vital biochemical processes and is required for the activity of more than 300 enzymes. Zinc-containing enzymes participate in many components of macronutrient metabolism, particularly cell replication. In addition, zinc-containing enzymes such as carbonic anhydrase and lactate debydrogenase are involved in exercise metabolism while superoxide dismutase protects against free radical damage. Zinc deficiencies have been shown to be higher in athletes and/or individuals who recreationally train [1–3]. Zinc deficiencies in athletes have been suggested to contribute to impaired immune function and decreased performance [1, 4–6]. Magnesium is a ubiquitous element that plays a fundamental role in many cellular reactions. More than 300 metabolic reactions require magnesium as a cofactor. Some important examples include glycolysis, fat and protein metabolism, adenosine triphosphate synthesis, and second messenger system. Magnesium also serves as a physiological regulator of membrane stability and in neuromuscular, cardiovascular, immune, and hormonal function. It also appears that there is a relationship between magnesium levels and cortisol, which has been reported to have negative effects on strength gains and muscle mass during training. A 1984  study found that 14 days of magnesium supplementation decreased cortisol which would theoretically reduce catabolism during training. Another study reported similar results concluding that magnesium supplementation reduced the stress response without affecting competitive potential . Athletes have been reported to have lower levels of zinc and magnesium possibly due to increased sweating while training or inadequate intake in their diets [2, 3, 9–12]. Additionally, zinc and magnesium supplementation has been reported to have positive effects on resistance training athletes [13–16]. Theoretically, zinc and magnesium supplementation may enhance anabolic hormonal profiles, reduce catabolism, improve immune status, and/or improve adaptations to resistance training. In support of this theory, Brilla and Conte  reported that ZMA supplementation during off-season football resistance training promoted significant increases in testosterone, IGF-1, and muscle strength. However, it is clear that more research is needed before conclusions can be drawn. The purpose of this study was to determine whether supplementing the diet with a commercially available supplement containing ZMA during training affects zinc and magnesium status, anabolic and catabolic hormone profiles, and/or training adaptations. Forty-two resistance-trained male subjects participated in this study. Subjects had to have at least of one year prior resistance training at a frequency of three times per week to be considered for this study. Subjects were excluded from participation if they were not between 18 – 50 years of age; had reoccurring or chronic joint problems; were diagnosed with cardiovascular or pulmonary disorders and/or disease; had abnormal heart rate or blood pressure; had less than one year of training experience; and/or had been recently instructed by a physician not to participate in high intensity exercise. A physical readiness questionnaire was completed to assess general health of the participant. Subjects were not currently (or in the past six months) taking dietary supplements containing creatine, glutamine, arginine, HMB, androstendione, thermogenics, or any other ergogenic supplement. Subjects meeting eligibility criteria were informed of the requirements of the study and signed an informed consent statement in compliance with the Human Subjects Guidelines of Baylor University and the American College of Sports Medicine. Subjects were descriptively 27 ± 9 years; 178 ± 8 cm, 85.15 kg, and 18.6 ± 6% body fat. This study was conducted as a randomized, double blind, placebo controlled clinical trial. Subjects completed two familiarization sessions one week prior to baseline testing. During the familiarization sessions, subjects completed a health history questionnaire, personal information sheet, and signed an informed consent statement. In addition, subjects completed one set of leg press and bench press as well as a Wingate anaerobic power test. Each participant was given personal instruction on how to fill out their training and diet logs. Diet logs were kept in order to ensure caloric intake did not differ significantly between groups. Training logs were kept to document number of sets, repetitions and weight used during each training session. This was done to calculate training volume for each participant. Subjects were then scheduled to report to the lab for baseline testing (T1). Participants were instructed to refrain from exercise for 48 hours before each testing session and fast for 10 hours prior to donating blood. Additionally, subjects were instructed to keep a four day diet record (including one weekend day) prior to each testing session. Testing sessions included assessment of body weight and body composition, procurement of fasting blood samples, and performing 1-RM and 80% of 1-RM tests on the bench press and leg press and a Wingate anaerobic power test. Subjects were then randomized to ingest placebo or ZMA supplements and to begin training as described below. Participants returned to the lab after four (T2) and eight weeks (T3) of training. Nutritional records were evaluated and analyzed by a registered dietitian using the Food Processor nutritional analysis software (ESHA Research Inc., Salem, OR). Height was measured using standard anthropometry and total body weight was measured using a calibrated electronic scale with a precision of ± 0.02 kg (Bridgeview, Illinois). Total body water was estimated using a Xitron 4200 Bioelectrical Impedance Analyzer (Xitron Technologies Inc., San Diego, CA). The BIA method has been determined to be a valid measure for total body water . Whole-body (excluding cranium) composition was estimated by certified personnel using a Hologic QDR-4500W dual-energy x-ray absorptiometry (DEXA) using Hologic software version 9.80C (Waltham, MA). This test evaluates body composition and body density by scanning the entire body with a low dose of radiation taking approximately 6 min. An analysis of the subject's fat mass, soft tissue (muscle) mass, and bone mass was provided and used to determine body composition changes throughout the duration of the study. The DEXA scans regions of the body (right arm, left arm, trunk, right leg, left leg) to determine bone mass, fat mass and lean mass within each region. The scanned bone, fat, and lean mass for each region is then subtotaled to determine whole-body (excluding cranium) values. Percent body fat was determined by dividing the amount of fat mass by the total scanned mass (bone mass, fat mass and lean mass). Test-retest reliability studies performed on male athletes with this DEXA machine yielded a mean deviation for total BMC and total fat free/soft tissue mass of 0.31% with a mean intra-class correlation of 0.985. This method of determining body composition has been shown to be valid . Subjects then donated approximately 25 ml of fasting blood using venipuncture techniques of an antecubital vein in the forearm according to standard procedures. Two 10 mL serum separation (SST) vacutainers and one 5 mL anticoagulant tube containing K3 (EDTA) vacutainer was inserted for blood collection using multiple sample phlebotomy techniques. Serum from the SST were centrifuged at 5,000 rev × min-1 for 10 min using a Biofuge 17R centrifuge (Heraeus Inc., Germany). Serum from both SSTs was transferred into three microcentrifuge tubes and frozen at -80°C for subsequent analysis. Remaining serum was transferred from the SST and placed into a sterile collection tube. Serum and whole blood samples (EDTA) were refrigerated and sent to Quest Diagnostics Labs (Dallas, TX). A complete 31 panel clinical chemistry profile and various markers of muscle/protein breakdown, shown in Table 1, was run on serum samples using the Technicon DAX model 96-0147 automated chemistry analyzer (Technicon Inc. Terry Town, NY) following standard clinical procedures. Whole blood cell counts with percent differentials were run on whole blood samples using a Coulter STKS automated analyzer using standard procedures (Coulter Inc., Hialeah, FL). These analyzers were calibrated daily to controls according to manufacturer's recommendations and federal guidelines for clinical diagnostic laboratories. Test to test reliability of performing these assays ranged from 2 to 6% for individual assays with an average variation of ± 3%. Samples were run in duplicate to verify results if the observed values were outside control values and/or clinical norms according to standard procedures. Total and free testosterone, IGF-1, growth hormone, and cortisol levels were assayed in duplicate in the Exercise Biochemical Nutrition Laboratory (EBNL) using standard ELISA techniques. Test to test reliability of performing these assays were ± 3–5%. Serum zinc and magnesium levels were assayed using standard procedures by the Department of Human Nutrition at The Ohio State University under the supervision of Robert DiSilvestro, PhD. Test to test reliability of performing these assays were ± 2–4%. Mean corpuscular hemoglobin (MCH) blood cell. Subjects warmed-up (2 sets of 8 – 10 repetitions at approximately 50% of anticipated maximum) on the bench press. Subject's then performed successive 1 RM lifts starting at about 70% of anticipated 1-RM and increasing by 5 – 10 lbs until the subject reached their 1-RM. After the acquisition of max the participant rested five minutes and completed as many repetitions as possible at 80% 1-RM to asses' muscular endurance. Subjects were instructed on proper technique and mechanics of the movement. Hand position was also recorded to ensure test to test reliability. Subjects then rested for 10 minutes and warmed-up on the Nebula 45° Leg press (2 sets of 8 – 10 repetitions at approximately 50% of anticipated maximum). Subjects then performed successive 1-RM lifts on the leg press starting at about 70% of anticipated 1-RM and increasing by 10 – 25 lbs until reaching the subject's 1-RM. Subjects then perform an 80% of 1-RM endurance repetition tests on the hip/leg sled. Foot placement and sled height were recorded to ensure test to test reliability. All strength testing was supervised by a Certified Strength and Conditioning Specialist (CSCS). Test to test reliability of performing these strength tests on resistance-trained subjects in our laboratory have yielded low mean coefficients of variation and high reliability for the bench press (1.9%, intraclass r = 0.94) and leg press/hip sled (0.7%, intraclass r = 0.91). Subjects then performed a single standardized Wingate cycle ergometry test to assess anaerobic capacity and power. This test consisted of having each participant sprint in an all out fashion on the bicycle ergometer for 30-sec against a standard workload of 0.075 kg/kg of body weight. Correlation coefficients of test-retest reliability for absolute peak power and mean power has been found to be r = 0.692 and r = 0.950, respectively. Subjects were matched into two groups according to fat free mass, age, and resistance training experience. Subjects were then randomly assigned to receive in a double blind manner a dextrose placebo or Z-Mass PM™ (Cytodyne Technologies, Lakewood, NJ). Subjects ingested 4 capsules a day on an empty stomach 30–60 minutes prior to going to bed for 8-weeks according to label instructions. Each daily dose of Z-Mass PM™ contains 11 mg of Vitamin B-6 (pyridoxine hcl), 450 mg of magnesium (as magnesium aspartate), 30 mg of zinc (as monomethionine and aspartate), 10 mg of potassium (as potassium aspartate), and 706 mg of a proprietary blend of mucuna pruriens (seeds) standardized for 50 mg of L-Dopa (purported as a muscle relaxant) and Polypodium Vulare/Suma root (herb) standardized for 30 mg of 20-hydroxyecdysone (a plant sterol purported to reduce catabolism). Supplementation compliance was monitored on a weekly basis by a research nurse as well as by having the subjects return the bottles and left over supplement at the end of 4 and 8 weeks of supplementation. The pill count method was used to determine supplement usage and subject compliance. On a weekly basis subjects were asked to complete a "weekly follow-up assessment" chart that addressed possible symptoms or side effects related to the supplementation and training. Subjects participated in a periodized 4-day per week resistance-training program split into two upper and two lower extremity workouts per week for a total of 8-weeks. The subjects performed an upper body resistance-training program consisting of nine exercises (bench press, lat pull, shoulder press, seated rows, shoulder shrugs, chest flies, biceps curl, triceps press down, and abdominal curls) twice per week and a seven exercise lower extremity program (leg press or squat, back extension, step ups, leg curls, leg extension, heel raises, and abdominal crunches) performed twice per week. Subjects performed 3 sets of 8 repetitions during weeks 0 – 4 with as much weight as they can lift and 3 sets of 10 repetitions during weeks 4 – 8 with as much weight as they could handle (typically 60 – 80% of 1-RM). Rest periods between exercises were no longer than 3 minutes and rest between sets were no longer than 2 minutes monitored with a standardized timer. Each participant was given instruction on technique by a Certified Strength and Conditioning Specialist (CSCS). Dependent variables were analyzed by univariate analysis of variance (ANOVA) with repeated measures using SPSS version 11.5 software (Chicago, IL). Due to loss of some frozen samples, serum zinc, magnesium, and hormone levels were determined on a subset of 26 subjects (n = 13 P, n = 13 ZMA). Data are presented as means and ± standard deviation changes form baseline for the P and ZMA groups, respectively. Data were considered significantly different when the probability of error was < 0.05. Power analysis in a 2 × 3 design indicates that an n-size of 20 per group yields high power (>0.9) for delta values of 0.75 to 1.25. No significant clinical side effects, related or unrelated to the study, were reported to the research nurse by any subject throughout the course of the study. All subjects tolerated both the training and supplementation protocols without any problems. No significant differences were observed between groups total caloric intake or training volume. No significant differences were observed between groups in total protein, albumin, globulin, glucose, electrolytes, liver enzymes, lipid profiles, total bilirubin, hemoglobin, hematocrit, red blood cells or white blood cells. Figure 1 illustrates the changes observed in plasma zinc levels between the placebo and ZMA groups. Plasma zinc levels were within normal ranges and were non-significantly increased by 12–17% after supplementation in the ZMA group (P T1 1.08 ± 0.2, T2 1.02 ± 0.14, T3 1.07 ± 0.25; ZMA T1 1.04 ± 0.24, T2 1.15 ± 0.27, T3 1.20 ± 0.23, μg/ml, p = 0.12). Magnesium levels were also within normal ranges and were not significantly affected by supplementation (P T1 26.5 ± 2.3, T2 27.2 ± 2.5, T3 27.6 ± 2.3; ZMA T1 26.9 ± 1.7, T2 28.0 ± 2.7, T3 26.9 ± 3.6 μg/ml, p = 0.40). Change in plasma zinc levels (mean ± SD) between two groups (grey = placebo, black = ZMA) over eight weeks of standardized resistance training. Figure 2 shows changes in anabolic and catabolic hormones observed between the two groups during the study. No significant differences were seen between groups in mean IGF-1 (P -25.7 ± 60; ZMA 0.2 ± 41 ng/mL, p = 0.23), total testosterone (P -0.12 ± 1.3; ZMA -0.47 ± 0.9 ng/mL, p = 0.50), free testosterone (P -1.62 ± 5.5; ZMA -1.68 ± 5.3 pg/mL, p = 0.96), cortisol (P -1.06 ± 5.2; ZMA 0.41 ± 6.3 μg/dL, p = 0.54), total testosterone to cortisol ratio (P -0.014 ± 0.14; ZMA -0.011 ± 0.2, p = 0.97), or growth hormone (P 0.03 ± 0.19; ZMA 0.01 ± 0.13 ng/mL = 0.78). 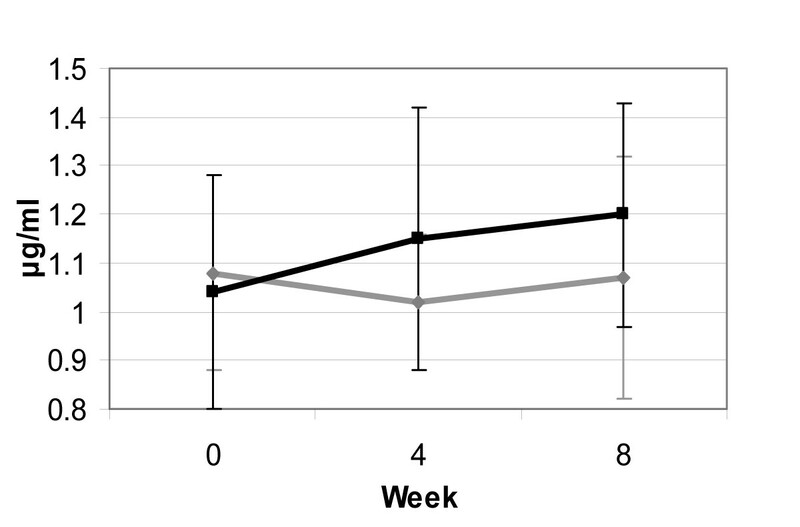 Change in anabolic and catabolic hormones (mean ± SD) between two groups (grey = placebo, black = ZMA) over eight weeks of standardized resistance training. Figure 3 presents body composition changes observed between the two groups over time. Although some potentially favorable trends were observed, no statistically significant differences were seen between groups in mean changes in body mass (P -0.17 ± 2.0; ZMA 0.27 ± 2.0 kg, p = 0.61), scanned fat free mass (P 0.15 ± 1.3; ZMA 0.73 ± 1.5 kg, p = 0.20), scanned fat mass (P -0.08 ± 1.0; ZMA -0.74 ± 1.5 kg, p = 0.12), or percent body fat (P -0.07 ± 1.2; ZMA -0.79 ± 1.5%, p = 0.10). Change in body composition (mean ± SD) between two groups (grey = placebo, black = ZMA) over eight weeks of standardized resistance training. No statistically significant changes were observed between groups in mean bench press 1-RM (P 3.6 ± 5.5 kg and ZMA 5.6 ± 5.9 kg, p = 0.24), leg press 1-RM (P 24.6 ± 25 kg and ZMA 25.4 ± 32 kg, p = 0.92), bench press lifting volume (P -51 ± 206 kg; ZMA 4 ± 186 kg, p = 0.38), or leg press lifting volume (P 480 ± 1,022 kg; ZMA 724 ± 1,258 kg, p = 0.48). Likewise, no significant differences were observed in sprint peak power (P 0.9 ± 10%; ZMA 3.6 ± 10%, p = 0.40), total work (P 8.0 ± 29; ZMA 1.1 ± 12.2%, p = 0.34), or fatigue index (P -1.0 ± 7.2%; ZMA -0.2 ± 8.7%, p = 0.76). The major findings of this study was that dietary supplementation of a commercially available ZMA supplement resulted in a non-significant 12–17% increase in serum zinc levels but did not appear to effect anabolic or catabolic responses to resistance training, body composition, or training adaptations. These findings do not support contentions that ZMA supplementation during training increases muscle mass and/or enhances training adaptations. The following provides additional insight to results observed. Athletes have been reported to have low zinc and magnesium levels which have been found to negatively impact performance [1, 4–6]. Brilla and Conte  reported that ZMA supplementation (i.e., 30 mg zinc monomethionine aspartate, 450 mg magnesium aspartate, and 10.5 mg vitamin B-6) promoted a 30% increase in plasma zinc levels (0.8 ± 0.1 to 1.04 ± 0.14 μg/mL) and a 6.1% increase in plasma magnesium levels (19.43 ± 1.2 to 20.63 ± 0.73 μg/mL). In the present study, fasting zinc and magnesium levels were within normal ranges (1.04 ± 0.24 to 1.08 ± 0.2 μg/mL) and training did not negatively impact on zinc or magnesium status. ZMA supplementation promoted only a modest but non-significant increase in plasma zinc levels (12–17%) while magnesium levels were not significantly affected. These findings indicate that within the population and sample tested, ZMA supplementation had no discernable effects on plasma zinc or magnesium status. While the present study did not assess tissue levels of these minerals, these findings suggest that ZMA supplementation may not be needed or beneficial in this population of athletes. In support of this finding, Lukasi  concluded that although some studies [2, 3, 9–12] have suggested that zinc and magnesium levels are diminished in athletes, most athletes get adequate dietary intake of booth zinc and magnesium. ZMA supplementation has been purported to increase zinc and magnesium status, anabolic hormones, and promote greater gains in strength during training. In support of this contention, Brilla and Conte  reported that ZMA supplementation significantly increased free testosterone, IGF-1, and isokinetic strength gains during training. Results of this study do not support these findings. 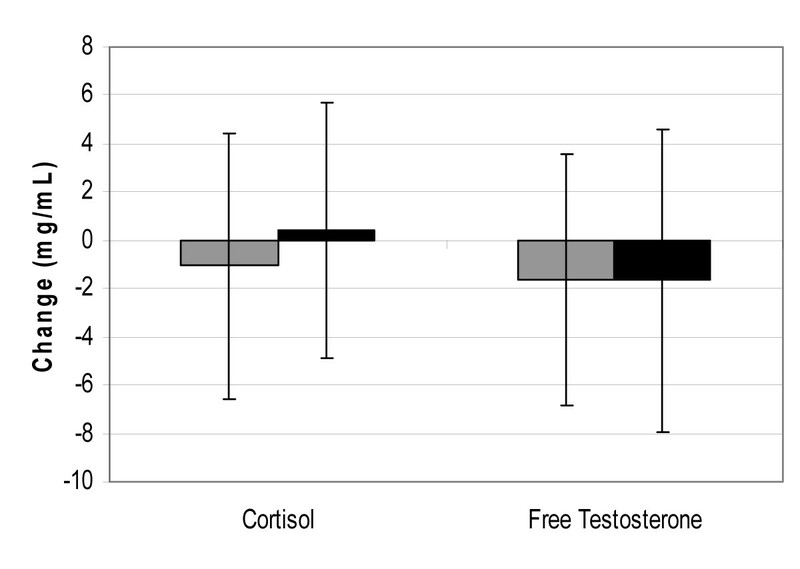 In this regard, ZMA supplementation had no significant effects on total and free testosterone, IGF-1, growth hormone, cortisol, the ratio of cortisol to testosterone, or muscle and liver enzymes in response to training. Moreover, no significant effects were observed between groups in changes in 1-RM strength, upper or lower body muscle endurance, or anaerobic sprint capacity. 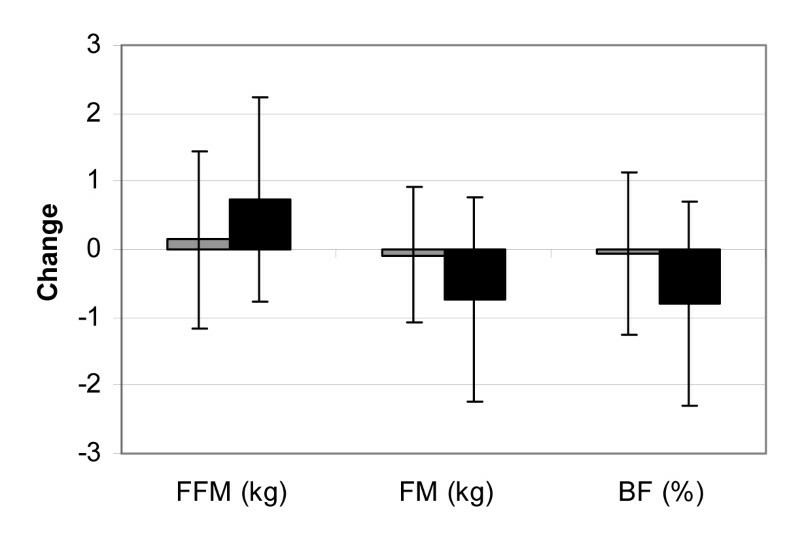 Interestingly, while some contend that ZMA supplementation may increase muscle mass during training, the Brilla and Conte  paper reported that ZMA supplementation had no effect on body mass changes during training. Results of the present study support these findings in that ZMA supplementation had no significant effects on body mass or DEXA determined body composition values. However, it should be noted that some potentially favorable trends were observed in fat free mass, fat mass, and body fat that deserve additional study. Results of the present study do not support contentions that ZMA supplementation increases zinc or magnesium status and/or affects training adaptations in experienced resistance trained males with normal zinc status. These findings are in contrast with the notion that ZMA supplementation can increase zinc and magnesium status, anabolic hormone status, and/or strength gains during training. These findings refute claims that ZMA supplementation in the amount and manner investigated provides ergogenic value to experienced resistance trained athletes. Whether higher levels of ZMA is needed to promote these adaptations in experienced resistance-trained males; ZMA supplementation may influence zinc and magnesium status and/or training adaptations in individuals with low zinc and magnesium status; and/or, whether ZMA supplementation may have therapeutic and/or ergogenic value in other populations (e.g., untrained, females, elders, etc) remains to be determined. We would like to thank the subjects that participated in this study and the laboratory assistants in the Exercise and Sport Nutrition Laboratory (ESNL) who assisted with data collection and analysis. The authors would also like to thank Dr. Bob DiSilvestro from Ohio State University who performed the zinc and magnesium assays. This study was funded by a research grant from Cytodyne Technologies, Inc. (Lakewood, NJ). Researchers in the ESNL independently collected, analyzed, and interpreted the results from this study and have no financial interests in the results of this study. Presentation of results in this study does not constitute endorsement by Baylor University or its authors of the supplements investigated.